Valencia consolidates its position as the world’s fastest 21-kilometre trial. After both the Women’s World Record set by Joyciline Jepkosgei (1:04:51) in the last Valencia Half-Marathon, and the World Record set in the Women’s Half-Marathon (Gudeta Kebede, 1:06:11), Abraham Kiptum’s triumph in setting a new Men’s World Record for the 21-kilometre race shows that Valencia is the world’s fastest city for both sexes over this distance. Together with Kiptum, Jemal Yimer Mekonnen (58:33), Abadi Hadis Embaye (58:44), Amdamlak Belihu Berta (59:19), Stephen Kiprop (59:21), Bernard Kipkorir Ngeno (59:22), Elhassan Elabbassi (59:27), Simon Cheprot (59:28), Abel Kipchumba (59:29), and Joshpat Boit (59:42) all ran the race in under an hour in what is Spain’s best half marathon for the eighth year in a row. 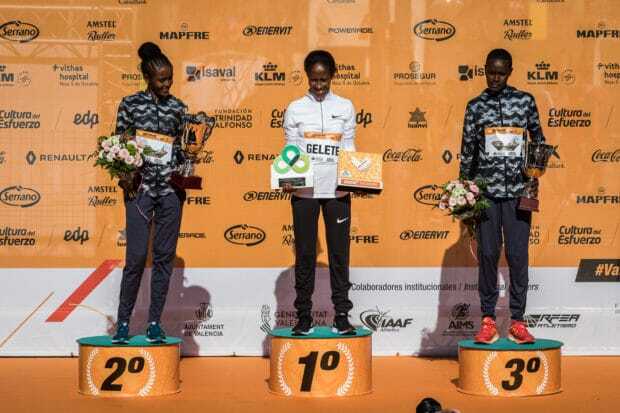 Gelete Burka Bati was the winner of the 28th edition of the Valencia-Trinidad Alfonso EDP Half-Marathon in the women’s category with a time of 1:06:11. Following hot on her heels in the world’s fastest half marathon were Alia Mohammed Saeed (1:06:13) and Edith Chelimo (1:06:18).